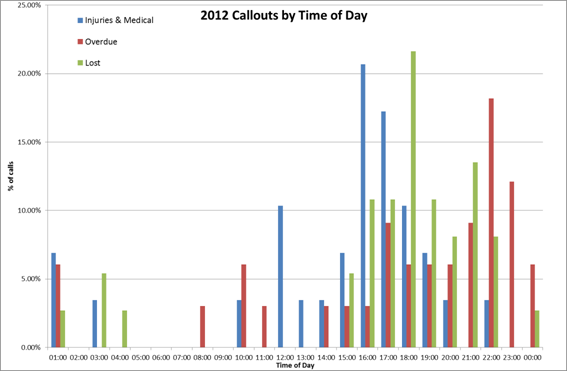 On the face of it 2012 was another busy year for the team with a total of 121 – 999 calls received. As shown in the graph below this makes 2012 the second busiest year for the team. The presentation of data and definitions used is the same as that previously published on the team website in the review of calls between 2003 – 2011. However, digging a little further into the data reveals some interesting trends. 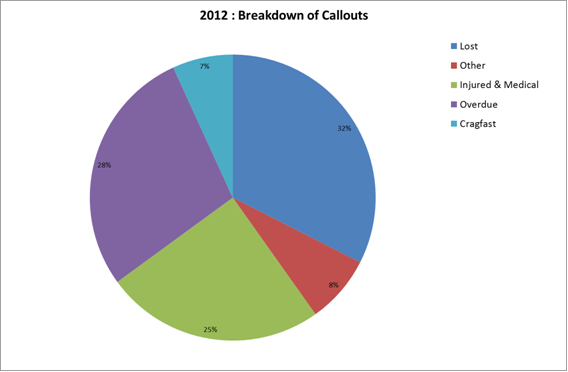 Full team callouts are marginally down on the previous year and limited calls up. Whether these changes are significant is less certain. As shown, less than half the 999 calls result in a full team response. What is apparent from the figure is the increase in alerts, where the team is contacted but there is no need for deployment on the fell. Of the 121 incidents the breakdown is shown overleaf using the same definitions as in previous reviews. 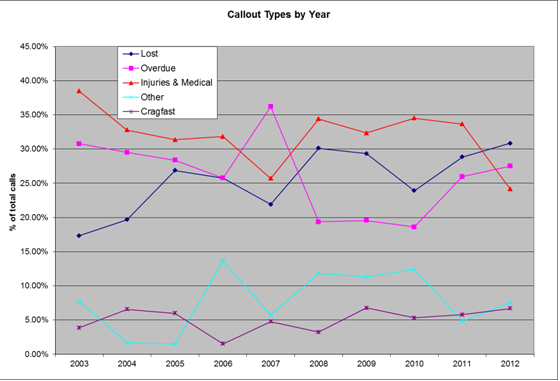 The proportions of types of calls are consistent with previous years, except the injuries & medical which shows a fall as a % of the total. 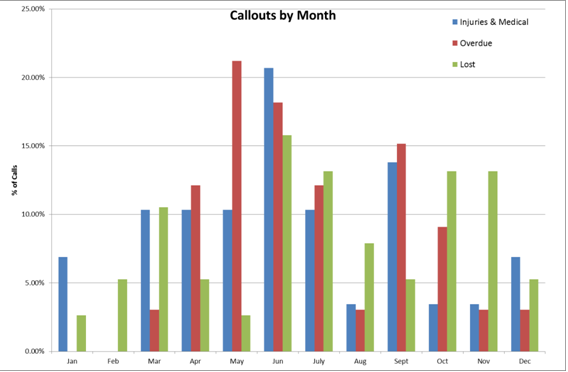 The plots overleaf show the breakdown of calls by month of the year and time of day. The axis for time of day corresponds to the end of the data bin, ie : 18:00 = 17:01 – 18:00. The breakdown by month is broadly consistent with previous years. The winter months, December – Feb are relatively quiet and the majority of rescues occur between April – October. 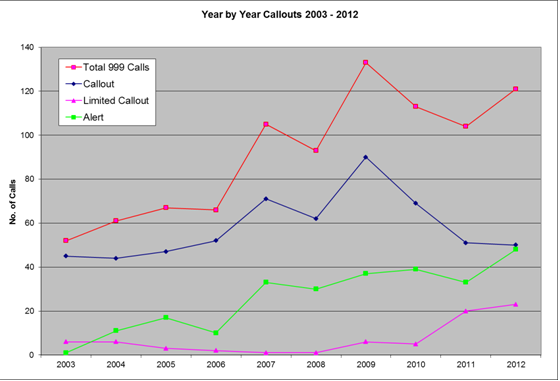 August was uncharacteristically quiet in 2012, whilst June saw the most calls. This includes a high number of lost and overdue even though it has the most daylight showing the influence of 3 peaks and similar events. The breakdown by time of day is also broadly consistent with previous years. The same pattern of peaks in injuries, lost and overdue is observed, with > 60 % of the injuries being reported between 15:00 – 19:00, > 60 % of the losts between 16:00 – 20:00 and > 60 % of the overdues between 18:00 – 00:00. 2012 was a busy year for the team in terms of 999 calls taken but as shown in this review in many respects it was not unusual, the main change being the rise in alerts. The biggest category, 38 % correspond to people reported missing who later turned up, without requiring assistance from the team. 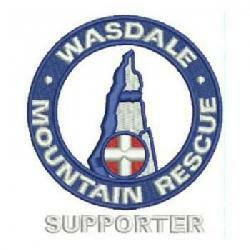 It can be hard to know when is the right time to call for assistance, particularly for people who are not on the fell and are unaware of the mountain conditions. It would be inappropriate for this article to suggest anyone should hold back from reporting missing people, particularly if there are any additional reasons for concern. Perhaps the best use of this information is to show that often there is no cause for undue alarm for anyone who does call in. 2012 saw the introduction of Sarcall, a new system for calling out teams now used by both Cumbria Police and North West Ambulance. The software includes a Gazetteer of place names and the team covering them to allow the call handler to task the right team based on the information supplied. It might have been expected that some ‘bedding in time��� would be needed for Sarcall and the gazetteer. There were certainly one or 2 unusual allocations during 2012 however 6 mis-directions out of a total of 120 does not appear unreasonable. Just under �� of the alerts (talk offs and other help) correspond to situations where the incident was resolved either by phone or by passing walkers. It follows from this that the situation was not particularly serious, normally either navigation problems or difficult ground. A positive recent development in this area is the ability to locate a modern ‘smart phone’ with a built in GPS so long as there is a good signal. This has enabled a number of callers to be located and then given precise directions to make their own way off the mountain, avoiding team deployment however, as it needs both a good signal, good battery life and the ability to keep the phone dry it should not be relied on. It is these categories of alerts where a little more ability and self reliance would have avoided the need for any team involvement. 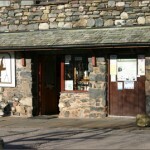 Overall the increase in alerts should not necessarily be seen as a bad development as by definition it shows that mountain incidents are being managed without the need to send people onto the fells.